In an era where we witness various movies on different concepts, ideologies, and genres, to create such a remarkable cinema is not only the contribution of the mainstream cinema Bollywood by creating movies like Dangal, Airlift etc. but also from the other parts of India as well which generally quotes as Regional Cinema. Movies like Kurukshetra (Malayalam), Sairat and Court (Marathi) and of course Baahubali (Telugu) are an example of this. These movies not only strengthened our belief in the power of Cinema but also the potential that Directors, Actors, Writers and Crew showcasing in the other and remote parts of India. 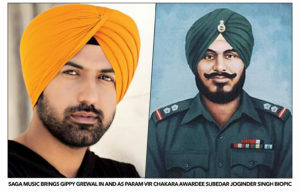 Like above-mentioned masterpieces, we are about to witness a gem of a movie produced by Saga Music and Seven Color Motion Pictures- a leading production house in Punjabi Cinema on a war hero, a veteran on the verge of retirement, a Param Vir Chakra recipient (India’s Highest Gallantry Award) (Posthumously) Subedar Joginder Singh. We have witnessed various war films in both Bollywood like Border, LOC Kargil, Lakshya etc. but Subedar Joginder Singh will be one of a kind biopic on a Gallantry Award Recipient for his Supreme Sacrifice for the nation. In a time when India is in a close combat situation with China over Doklam or Doka La region at India-Bhutan-China tri-junction, it will be a great significance for us to know about the War where these two countries met each other last time and how our unacclimated but valiant forces fought strong People’s Liberation Army of China. This movie is believed to cover the war scenarios and valor of our soldiers with the authenticity of languages spoken and events occurred along side of the war. Along with being a treat to watch, it will be a great honor to a warrior who martyred in a line of duty for the nation just to prove his only motto “Country above self”. This Independence Day let all of us pay tribute to the soldiers who gave their supreme sacrifice for saving our motherland.